A lot of business store owners kept asking us issues of setting up specific price rules for the store view level because they wanted to offer different promotions for customers in markets. However, default Magento 2 only processes the same promotion under the whole website, or it means admins cannot assign a particular price rule for a store view. That is the reason to encourage us to develop two solutions for business targeting multinational markets, making more convenient to specialize pricing or promotion strategies: Catalog Price Rule per Store View and Shopping Cart Rule per Store View. 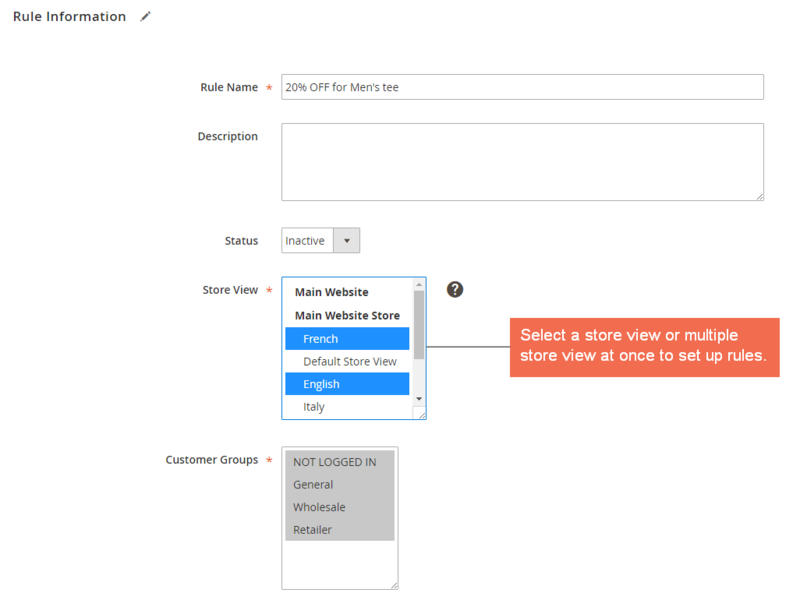 This module adds store views for administrators to select one and then set up a rule for this store view. The admin can also set up many rules for various store views at different discount values. Let’s take a look at the following examples: 2 different rules are set up for 2 store views and are also separately applied in the frontend. Catalog price rule per store view for Magento 2 is more and more unique and useful than other extensions when it allows administrators to select multiple store view to apply a rule at once. Multiple Store View Pricing for Magento 2 helps to set up different prices and special prices of products per store view. Therefore, when combining with Catalog Price Rule per Store View for Magento 2, store owners can have both more effective promotion and better pricing strategies for each store view. 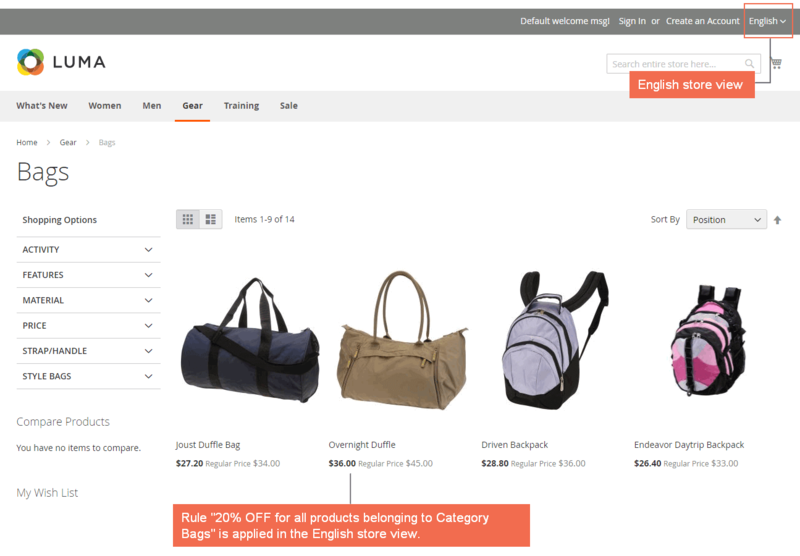 By using Magento 2 Catalog Price Rule per Store View extension, store owners can offer local customers different promotion programs which are the most suitable with their insights as well as their market situation. Therefore, this is a very important factor in providing business strategies for each local market as well as contributing to sales efficiencies in these places. 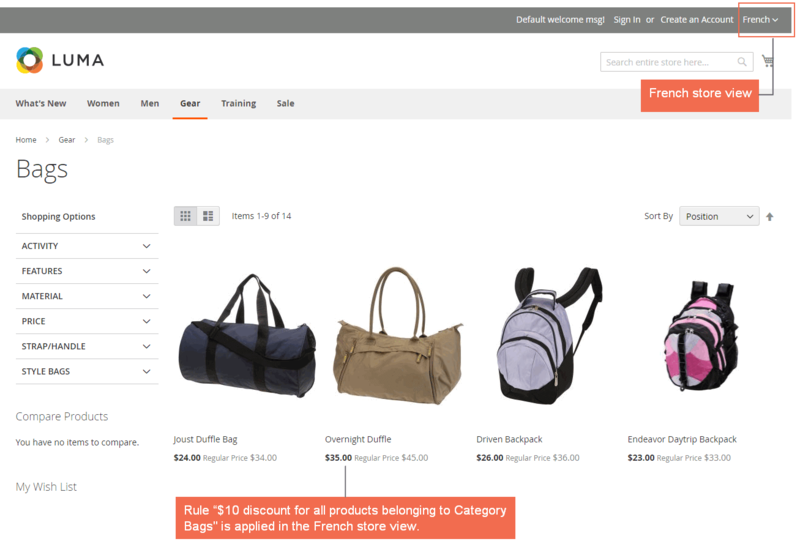 This is a true destination for Magento websites with multiple store views. I bought 3 multiple store views extensions from them and all are working well. Even they had some issues, but BSS support team helped me solve them quickly. This module meet my expect because my site has 3 store views and I always want to apply different promotion for each store view. Firstly, I have a problem and support team help me so much. They are so professional. Like way your extension do for catalog price rule. Save time and effective.